Idamae Unger, nee Taylor. Age 90 formerly of Park Ridge. 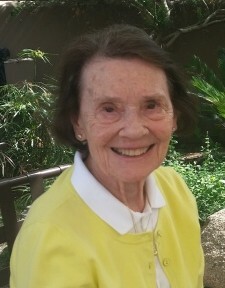 Beloved wife of the late Joseph F. Unger. Loving mother of Katie (Gordon) Toland, Peggy (Patrick) Morris, Jane (Dan) Poppelreiter, Patty (Tom) LaCalamita, Jim Unger and Betsy (Mike) Neville. Devoted grandmother of Thomas LaCalamita, Christian (Jessica) Poppelreiter, Elizabeth and Marguerite Morris, Carolyn, Katie, John and James Neville. Dear sister of Marion Murray and the late Jane Kelliher and James Taylor. Visitation Tuesday, May 29, 8:30 a.m. at Ryan-Parke Funeral Home, 120 S. Northwest Hwy., Park Ridge. Funeral Mass to follow at 10 a.m. in St. Paul of the Cross Church. Interment All Saints Cemetery. In lieu of flowers, memorials to Carmelite Monastery, 949 River Road, Des Plaines, IL 60016 or Misericordia/Heart of Mercy Center, www.misericordia.org, are appreciated.